UDM Downloads > iPhone Movie Converter! iPhone Movie Converter Software can help you rip DVD to iPhone, convert various multimedia file formats to iPhone with high quality, super fast conversion speed. The DVD to iPhone Video Converter program is an All-In-One, One-Click solution for iPhone Video. It is the best software to convert DVD, AVI, MPEG, Xvid, WMV, MOV, ASF, DivX, RM, FLV, RMVB, VOB, etc. to iPhone. Super fast (up to 4x faster than other solutions) DVD movie conversion in high video quality plus many advanced features give you everything you need to turn iPhone into a portable movie player. Put, transfer, Watch iPhone DVD movies, TVs, home videos on the go - a new lifestyle to experience. 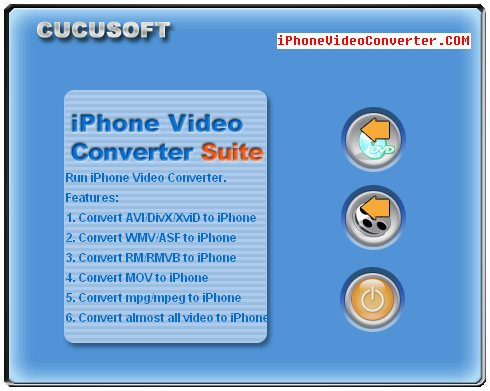 Download the software and learn more information at www.iphonevideoconverter.com More Features: Fully compatible with new iPhone, Up to 4x faster than other software, Fully optimized for Dual Core, Hyper-Thread processor. Optimized for Processor(SSE2/SSE/MMX/3DNow!) and Graphics Card Acceleration. Dolby, DTS Surround audio support.